Resolutions. They’re an important chance to have another go. Whether it’s the dusty gym membership or the pile of unread books. We can learn from what went well, what didn’t, and try again. Saving and investing is no different. What went well in 2018 and what didn’t? To give you a head start on next year’s resolutions, we’ve taken at look at some of our clients’ investing behaviours over the last year. Here are a few things we could all do with a reminder on. 2018 has been a noisy one. And by the looks of things next year won’t be any quieter. Brexit negotiations, trade wars and UK interest rates rising above 0.5% for the first time in nine years, were a few headlines we’ve faced. But rather than worry about the market impact of these events, or how to react in the short term, we think it’s best to remember your long term aims. The chart below shows the UK stock market’s performance over the past few decades. You might’ve invested at what you thought was the ‘worst possible point’. Maybe just before the dot com bust or the great financial crisis in 2009. But looking back from today, if you stayed invested, you’d have still made money. Please remember that doesn’t guarantee the same will happen again. By taking a step back you see that even with these short term events and setbacks, the stock market has continued to grow. The market will always fluctuate as investors react to new information. But companies will continue to navigate uncertainty and find ways to make money. As investors we should aim to do the same. Remember all investments can fall as well as rise in value so investors could make a loss. "I’m waiting for the market to drop before investing" or "I sold everything, the market's reached its peak" are arguments you might hear a lot over the holidays. Rather than listening in awe of this apparently superior market insight, we recommend you remind them of what’s important. And that’s ‘time in the market, not timing the market’. You could even show them the chart. Attempting to time the market is a common pitfall for investors. Trying to guess the outcome of a political or economic event is another one. Even if it turns out as you guessed, there’s no telling what the market might think of it. That’s why when there are a lot of unknowns we think it’s best to stick to what you can control rather than what you can’t. You can control staying invested and what you’re invested in. The main benefit of having a mix of different investments is to reduce risk. If you only hold one investment, you’ll enjoy all of the benefits but suffer the losses when they come. The chart below shows the performance of the main investment areas over the past 10 years. You can see that good performance one year, doesn’t always continue to the next. By having a spread you can help smooth out your returns over time. Past performance is not a guide to future returns. Past performance isn’t a guide to the future. Source: Lipper IM as at 30/11/2018, all data years are from 30 November - 30 November. Different assets like shares, cash or bonds are a good way to mix it up. 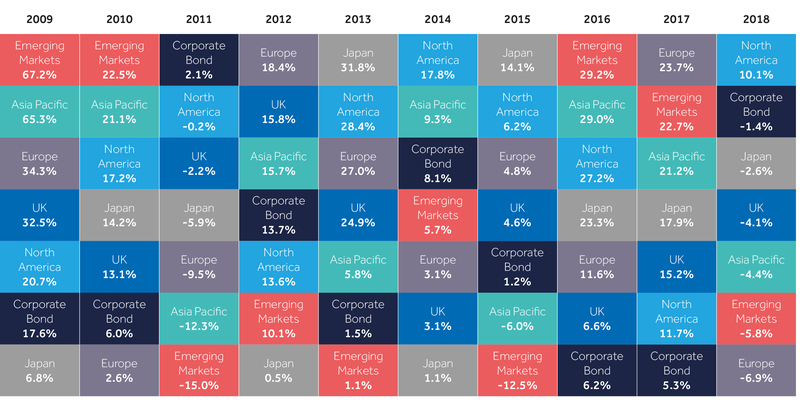 And different geographies, sectors or even investment styles add diversification too. If you’d prefer a less hands on approach, our Portfolio+ service gives you a selection of ready-made investments you can choose from. Each portfolio aims to achieve a headline goal – so you can pick one that matches your needs better. You need to regularly review the portfolio to make sure it still matches your needs and attitude to risk. There are risks to frequent trading other than mistiming. Cost is a big one. Trading costs are certain – tax, commission and the difference between the buy and sell prices can all detract from returns. Chopping and changing your investments can hurt your returns. You could even underperform a particular fund, if you’re going in and out of the same investment. Spotting and sticking with companies or fund managers that have the potential to succeed in the long term, gives you the best chance of growing your investments, although of course there are no guarantees. We’re here to help you make the most of your savings and investments – to secure your financial future. Our job is to give you everything you need to help you make the right decisions. We do the leg work, the analysis and the simplifying – so you don’t have to. Whether it’s cash savings or investment information you’re after, we’ve got it covered. We even have a team of friendly experts, happy to talk you through what’s available. We’re here to help. So why not ask us? Our helpdesk are here to answer any questions you might have, but can’t give you personal advice. If you’re not sure if an investment is right for you our team of advisers could help, and you only pay for the advice you need.